1980, 2005 edition completely reset. 158 pages, 8½x11, softbound. | Available on disk. The office of the Ottawa County Superintendent of Schools serves a multi purpose. The elected official works with federal and state officials, as well as county dependent and independent school systems. All student transfers, work permits, dropout reports and residence disputes are administered through the office. This office has provided untold numbers of individuals with age verification and other information helpful in establishing Social Security benefits and other federally funded areas. At the present time (1980) there are seven independent school districts within Ottawa County. They are: Quapaw, Picher, Commerce, Miami, Afton, Fairland and Wyandotte. The one dependent system is located at Turkeyford and is administered by the County office. In earlier times Ottawa County boasted 49 school districts, most of which were dependent systems. It is with much gratitude that we thank the present County Superintendent of Schools, Carl Pollard, for his great help. His interest, knowledge and desire to see these important public records preserved stands alone. Mr. Pollard, a life long resident of Oklahoma attended rural school and high school at Tahlequah, received his degree from Northeastern State University and his masters from Oklahoma University. Additional work has been completed at Central State University and Oklahoma State University. He has served in the capacity of classroom teacher, elementary principal, high school principal, and superintendent of schools, Cherokee County Superintendent of Schools and Ottawa County Superintendent of Schools. His wife Barbara, holds a degree from Northeastern Oklahoma College and a masters from Northeastern Oklahoma University and teaches in the Afton school system. Carl and Barbara have raised four lovely daughters who have distinguished themselves in the fields of teaching, nursing, respiratory therapy and secretarial work. We can not begin to express our appreciation of a gentleman with such foresight and concern for his fellow man. Without the cooperation of Mr. Pollard and his wonderful secretary, Jean Helm, our work could not have been completed. 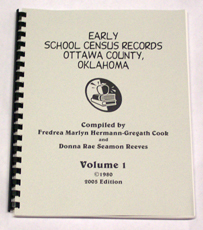 It is with this in mind that we extend our heartfelt thanks and wish to dedicate this first volume of the Early Ottawa County School Census, to Mr. Pollard and Mrs. Helm. A simple “Thank You” for all the help seems so small. The researcher will find that the following pages go a few steps beyond an index in that we have listed much more than names. This work contains an alphabetical listing of families within the various school systems of Ottawa County from 1912 to 1915, name(s) of persons giving information (usually parents), names and birthdates of all school age children, school district and a designation of Indian blood. A cross reference section, listing those persons appearing under another family name is in the rear of the book. There are 19 different tribes listed herein. It is our profound hope that this book and the volumes to follow will be of great value to the reader. Although we have noticed many misspellings and some dates that we believe to be absolutely incorrect, we have not altered them. It is our belief that the transcription of these county records should be as accurate as possible.